In the binary number system also we have our conventional mathematical operations of addition, subtraction, multiplication and division. We first discuss conventional binary addition, which is similar to conventional decimal addition. In the conventional decimal addition of two numbers, we write one number below the other and add as illustrated in Example 26. Example 26: Add decimal numbers 156 and 279. Solution: In the numbers given, let 156 be the augend and let 279 be the addend. 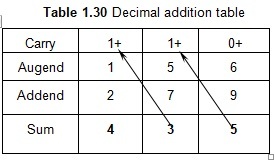 To add, we draw the decimal addition table illustrated in Table 1.30. It may be noted that the table has its first (or, topmost) row shows the carry from the previous addition. We notice that in the least-significant digit (LSD) position, carry is always zero because this is the first addition performed and hence has no carry to be brought forward from a previous addition. In the next significant position to the left of LSD, we have a carry of 1 from the addition in the LSD position. The addition in this position also produces a carry of 1, which is then added with most-significant digit (MSD) position. The final sum is shown in row 4 of Table 1.30. We first perform the addition of only two bits. Such 2-bit addition occurs in the addition of LSB poison of numbers; in the LSB position, no carry exists. Table 1.31 shows the 2-bit addition. In this table, the last row shows sum as 0 and carry as 1. This is because, in binary system, 1 + 1 = 10 ; of this, we notice that 0 represents the sum bit and 1 represents the carry bit (to be carried over to the next higher significant bit position. The binary circuit performing 2-bit addition is called as half-adder (see Section… ). In the 3-bit addition, we add augend, addend, and carry from the previous stage; this carry is designated as (carry)PS. The 3-bit addition yields the sum bit and the carry bit to next state, designated as (carry)NS. Since we have to add three quantities in binary addition, in all there will be o 8 (=23) possible combinations to add. This is a major advantage of the binary addition: we need to store only 8 possible combinations for addition in the binary scheme and the results of addition are known in advance. Such an adder adding 3 bits is called full-adder (see Section… ). 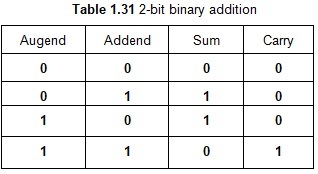 Table 1.32 shows the addition of 3 bits; it is based on this table that the practical full-adder chips are designed. Example 27: Add binary numbers 101 and 110. 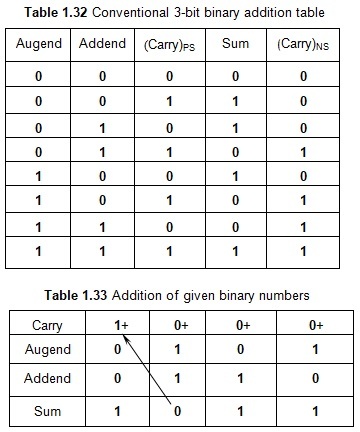 Solution: For performing the addition of the given binary numbers 101 and 110, we make use of the entries shown in Table 1.32 and draw Table 1.33, which performs the desired addition. In this, as in the case of decimal additions, we enter the augend in row 2, the addend in row 3 and the sum in row 4. The first row is reserved for the carry.